I try to let my mother know she’s appreciated whenever I can. She’s not perfect, nobody is but she does more for me and my brothers then anybody can even fully comprehend, even me to be honest. But back to this specific day subject for a second. Telling somebody with autism to feel something at a specific time is like telling a creature without eyes to pick a red flower out of a bouquet; they may get it right but it’s only going to be by chance. That being said, everyone is different. Maybe some find love easier to express then me. I have no trouble with expressing pride on command for instance. If I could do one thing on this day though it would be letting my mother know just how much she truly means to me. Words can’t do that and no actions I have the ability to do myself express it well enough. I guess this’ll have to do. Ma you are the fabric that keeps my reality together, you are the brightest light in my darkest days and the source from which I draw hope for humanity when I run low. You may not be perfect to everyone but you are to me. Oh you poor people, Smash being named as such give’s me acess to SO many pun’s, if there bad or not thats up to you (winks). so in this blog post i wanted to talk about some of the AMAZZING people I met at Smash.To say i was excited at smash would be a understatement there was so much to see and so much to do i only got a brief moment with a lot of these wonderful people but id like to share it none the less. These two where amazzing, ill probably be using that word a lot here. for those who havn’t played Bioshock Infinite Rosalind and Robert appear more then several times in it, to say they are crazy would be a understatment, but there only crazy by normal standards and this game dosen’t hold much of the norm. while they are comically convolouted a lot, they seem to hold a constant refinement all the time that makes them seem like they hold all the cards. 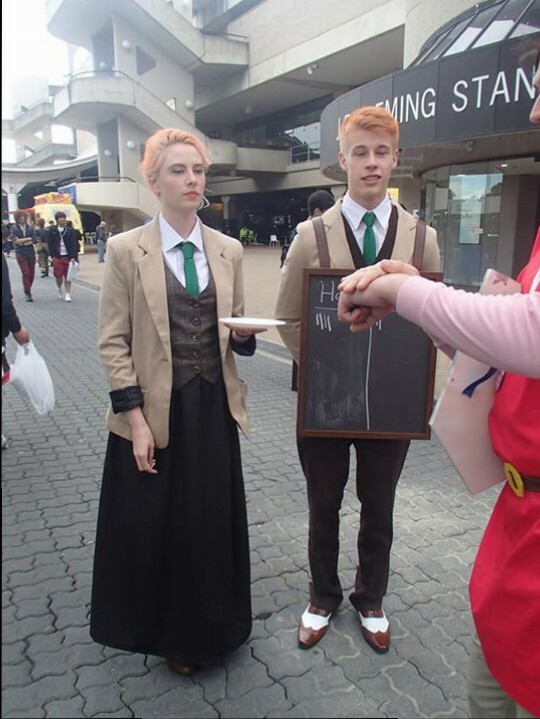 but i digress the cosplayers in these photos portrayed them so well it was almost scary, I approached these two with my fellow links and asked if i could flip the coin? as thats what you do in the game, the man playing the part of Roberet gave a slight nod while the lady playing the part of Rosalind extended her hand with the coin on the plate, everybody around us seemed to watch in anticapation as to the result of the coin flip. I fliped the coin and caught it in the air (all that coin flipping practice made me look pretty cool there) I had a look of anticipation on my face as I looked at the cosplayers doing a briliant job keeping there composure, my hand still on the coin i called it “tails!! !”,,,,,,,,, it was heads. i slouched in defeat Robert gave a small smile and Rosalind got out some chalk and put a point down for heads. I unfortunatly didnt get the names of these amazzing people but they left a “BIG” impact. I’ll admit it I fanboyed just a wee bit here Vanile and Fang are a big part of the story in final Fantasy XIII but i can go to deep into details without spoiling the game for you. Fang is a strong forceful woman who rush’s into combat usually with nothing but her iron will her weapon and a goal. Vanille is quite the opposite she hate’s combat, yet she will fight to the death for the hapiness and piece of other’s. I paused and thought to much about asking people for picture’s at Smash but here i didn’t, before i knew it i was posing and grinning like a idiot. 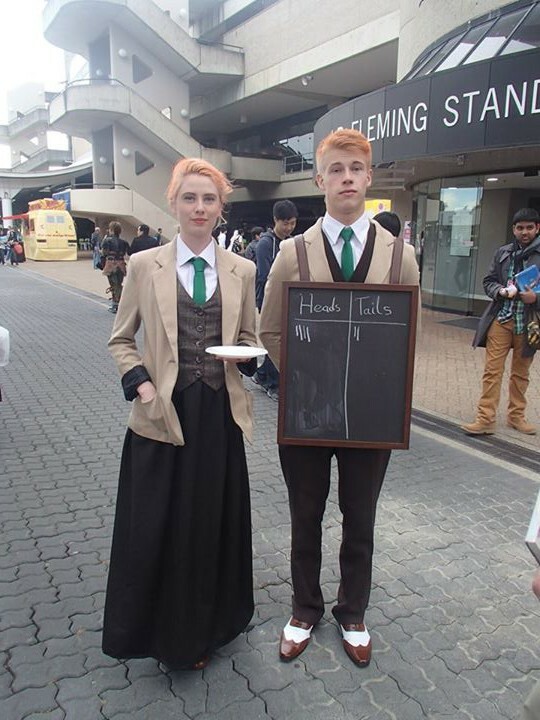 these cosplayers costumes where amazzingly detailed and the matched there personality to the characters quite well, again i didnt get there names to which im disapointed about but hopefully ill see them again at another convention. 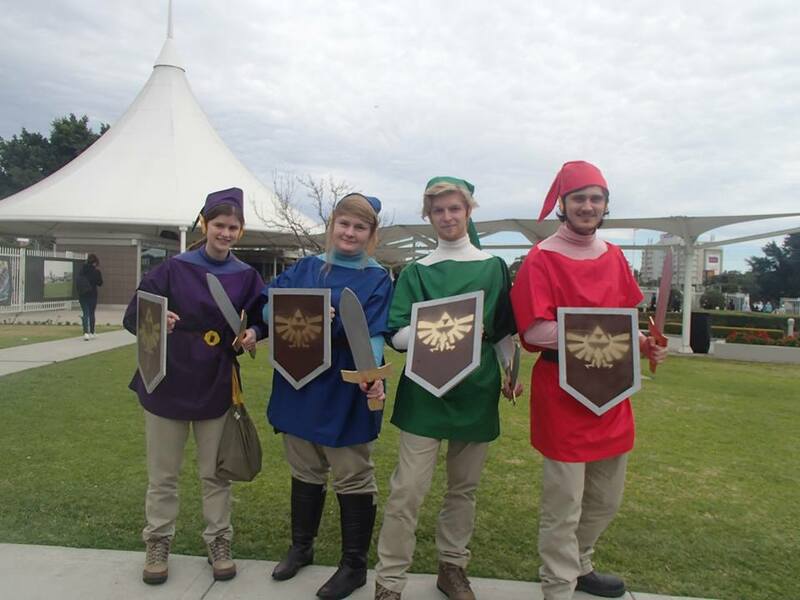 I had to do a little reaserch on this cosplay as I never had the pleasure to play The legend of Zelda Ocarina of time. Sheik is actually princess Zelda masking her apearence as a male Shiekah to acomplish her goal’s in secret. 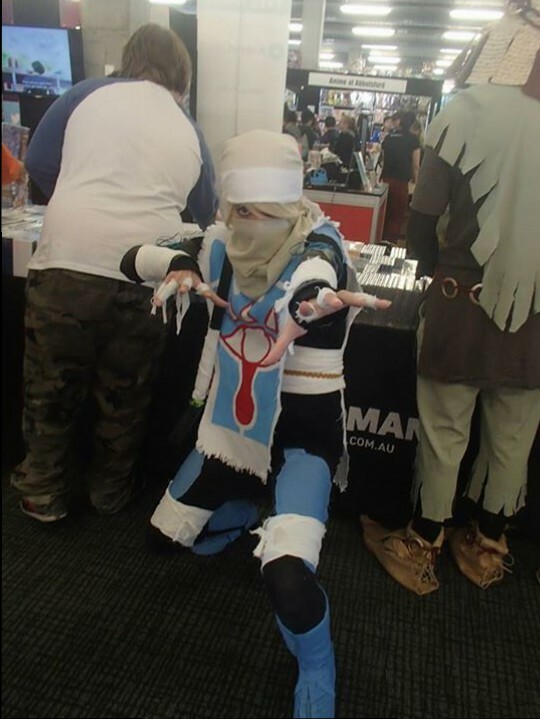 the lady cosplaying Shiek (or was she cosplaying princess zelda???) did a amazing job of it. 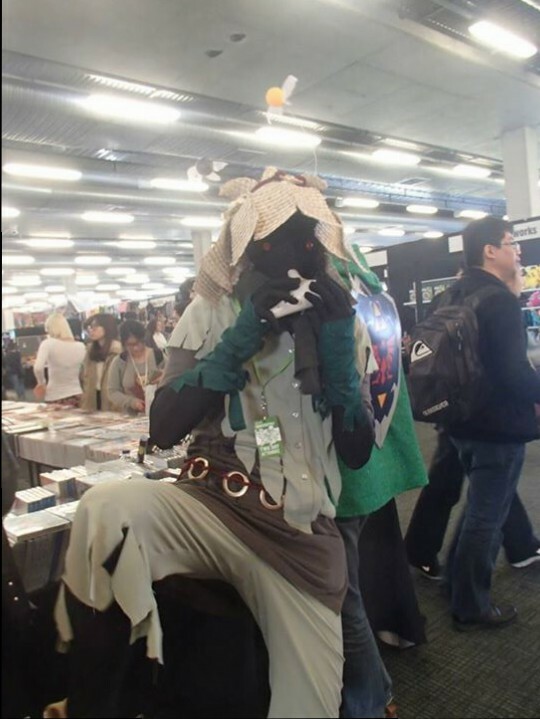 she was with her a friend who was cosplaying Skull kid from another Zelda game and they where into these character’s. Our green link went up to her to ask for a photo, she was browsing manga when nick asked her for her photo in but a split second she was in a pose waving her hand’s like she was weaving a spell. While I didnt understand the significance of the pose I apreciated and enjoyed her enthusiasm for the character she was cosplaying. 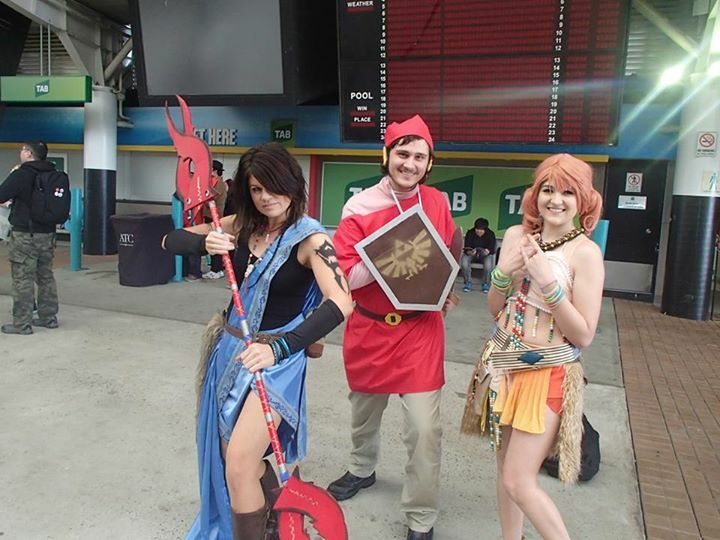 we stood here in aww at both Shiek and her friend Skull kid obviously a lot of effort went into there costumes. I think ill leave it here for now and start working on another one of these Smashing good company 2014 entries, next time ill talk about Skull kid and the friendly plumber who helped me fix my shield “MID CONVENTION” hope you enjoyed this so far. I started my cosplay jouney to smash with one week preperation and i was in bed sick for the 1st three of those days. I was to do the weapons and my friend Emily (Em) was doing the costumes, as a result i was unable to get the progress pictures i wanted. It seriously takes a lot of concentration and focus to make a costume, much more then i realised. i couldnt have met my deadline without the help from my mum, dad and nan as i simple didnt have the expirience with the required tools and material needed. in the end it got done though and my effort and stress was repayed back ten fold but with joy. I got to my friends house and i tried on the tunic, ears, hat and felt overjoyed for what was to come,. though to say i wasnt still nervous would be a gross lie, i was freaking out. I finished painting the shields and swords at my friends place with Em and after we finished we drew a quick picture on the tarp that was placed on the table. Em being the briliant artist she is drew a man ridding a horse while i drew a big moon smily face in the background, btw this was done with spraypaint so you can imagine the dificulty. the day finally arived and we took a seflie of ourselves on the way, a very new expirience for me. when we got there we got out and posed for some photos. he was rather certious we just where taken back that somebody wanted a photo of “us” throughout the day we got asked several more times for photos, we all thought our outfits would be nothing special but none of us where going to say that to each other we all admited it after the convention though and that we where surprised that nobody else shared our thought process everybody was overjoyed to see us they said the bigest draw about our costumes was the simple fact that we all where there, all of the 4 sword links. after the con i can see why keeping 4 people together was a big deal, we all wanted to do different things, yet didnt want to leave each other. Im going to do several blog posts about all the people we met the things i bought and stuff we did as i cant do it justice here (without ranting on). I was amazzed beyond words that i was able to be among so many people and not feel anxious, i felt like i was among friends among my own kind! people who regard friendship and a comen intrest as highly as I do. i could have stayed there all day i was in bliss i could hear white noise (like a school crowd) and it didnt bother me, and that to me is bliss. I used my iPhone for this I don’t have a android but I’m sure you could still get a opinion of meow chat from this review. Meow chat is a social networking app that allows you to talk to random people all over the world. $0 it’s free and that’s always good no? As with all things it takes awhile to get used to. Fortunately it’s very to the point, when you boot the app up for the 1st time it asks for permission for various thing such as to send you push notifications (sound similar to when you get a message) these are pretty standard for social networking apps. after that it’s pretty much free to explore, it’ll probably take you 10 minutes to 1 hour to understand completely, it took me the latter as I like to know the in’s and outs of everything. Him: how many marihuanas did you do? That happened in less then 30 second my head almost blew up but I think I handled it ok I also met a lovely girl from Vietnam who I chatted to about my pet rabbit sumo and we talked about animals, culture and many other things it was nice. I personally think meow chat is worth a try you don’t have anything to lose. Ps: I’m TheMindOfAutism on meow chat if you want to chat just favourite me and I’ll do the same. I’ve been struggling lately with what I want from life, how I’m gonna get it and how I’m going to cope with the stress it may bring. To say I have no idea would be a understatement of the complete confusion I’m currently feeling. How could I miss that??? In trying to do one and give the other up I’m essentially depriving you of a big part of me and I personally am depriving myself of sharing something I love. Autism is a part of me! As is gaming as is my respect for woman/elders, I love my country, I believe in free speech I’m socially awkward around new people/woman I talk to much when I’m trying to make a point and I sometimes make terrible jokes, all these are a part of me but not any one of them defines me, they define me as me when there all together. Simplicity itself, I mean who knows? 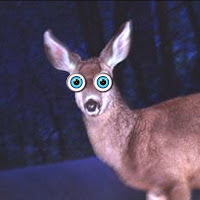 I might attract many crowds to my blog and truly wouldn’t that be a wonderful thing? looking at the catagories for my blog it seems somebody already belived I could do it all, my Ma. mum helps me with my blog when I need it. its funny how we can skip over those things sometime. what we think we need, what we think we dont have, and when we think people dont care, im lucky beyond words to have the mother I do. The founder and face behind 'The Mind of Autism'. Enter your email address to follow TMOA and receive notifications of new posts directly to your email. © Andrew Young and The Mind of Autism, 2014. Unauthorized use and/or duplication of this material without express and written permission from this blog’s author and/or owner is strictly prohibited. Excerpts and links may be used, provided that full and clear credit is given to Andrew Young and The Mind of Autism with appropriate and specific direction to the original content.